Barendrecht, 4 September 2017 – Last week, the LED lighting in the greenhouse at Kwekerij Verhoeven was switched on. For owner Ad Verhoeven, this signifies a huge step for his company. 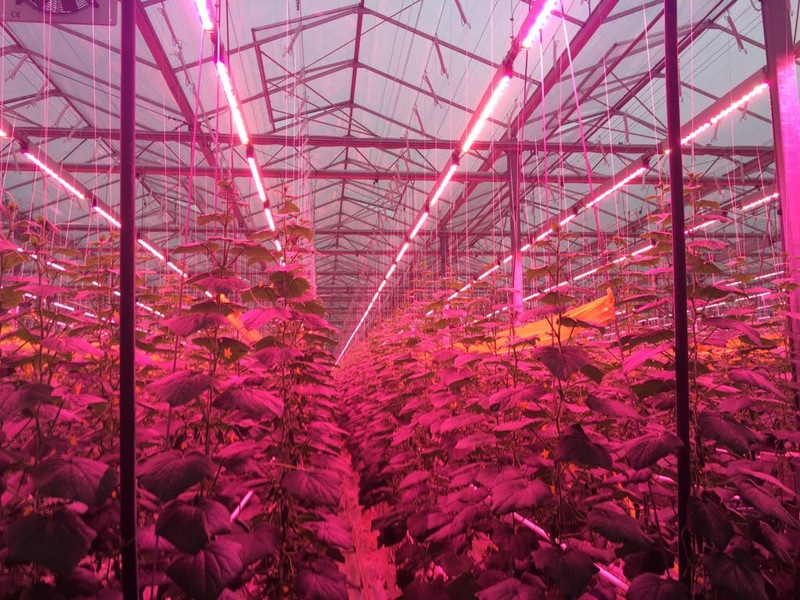 LED lamps were installed above a snack cucumber growing area of 2 hectares. The LED lighting enables Verhoeven to sustainably grow snack cucumbers year-round. LED lighting offers significant advantages. Philips started using LED lighting in the agricultural industry a decade ago, and maintains a considerable lead as the pioneer in the field. The company invests massively in this sustainable lighting. After several years of pioneering, the real LED lighting breakthrough came some five years ago in the tomato growing business. Wim Steeghs, Key Account Manager Philips Horticulture LED Solutions, is one of the experts at Philips and helped Ad in the planning phase. Wim has supervised numerous projects in the past, including the introduction of assimilation lighting for roses, Gerbera daisies, Peruvian lilies and even football grass. As the son of a cucumber grower and with a degree in horticulture, Wim's deeply interested in the sector. It makes him superbly qualified to advise growers during the project. ‘LED lighting is energy-saving; it saves 40% in energy. Moreover, the light is more efficient than conventional lighting. It gives off very little radiant heat, ensuring an optimum climate in the greenhouse. The plants do not want that heat. LED lightings allows the grower to increase the number of light hours without changing the climate in the greenhouse’. Ad also explains: ‘Cucumbers are sensitive to light, and when there are fluctuations in light it can halve production. Dark days send production plummeting. Using LED lighting, we can control the light in the greenhouse with utmost precision’. Ad chooses 100% LED lighting for cultivation: ‘Because you are one of the first, there is a lot that you must invent and find out yourself; it's still very much pioneering. Fortunately, Philips has a great deal of expertise, and we conducted a test in recent weeks. It looked great! The lights are connected to a hoist system that allows us to move the light closer to the plants. We came up with it in the process of brainstorming. During the test, we observed that the plants grow better this way. It allows us to use 100% of the light’. Wim: ‘No two companies are the same, which makes LED lighting implementation a matter of custom design. Ad had a clear idea of what he wanted. I was impressed by his company's position in the market. Ad is truly a trendsetter! The cultivation technology in his company is top-notch. LED lighting is a huge investment per square metre. If you make a cultivation mistake, you're left with some very expensive lamps. Consequently, careful control of cultivation is vitally important’. For Kwekerij Verhoeven, the retail customer and the consumer are the focus. ‘Together with The Greenery, we want to provide our customers with good, reliable and sustainably grown Dutch snack cucumbers year-round. Our company is Milieukeur certified, and we grow our snack cucumbers using organic pest control methods, which means our products can be eaten as soon as they are harvested. Using the LED lighting, we can now offer our snack cucumbers with our quality standard directly from our greenhouse, all year long’.